Run Time: 41 Minutes For ARMORERS and NEW SHOOTERS alike…Choose to field strip or completely disassemble and reassemble your firearm with confidence. With millions sold, the Ruger 10/22 has become one of America’s most popular 22 rifles. 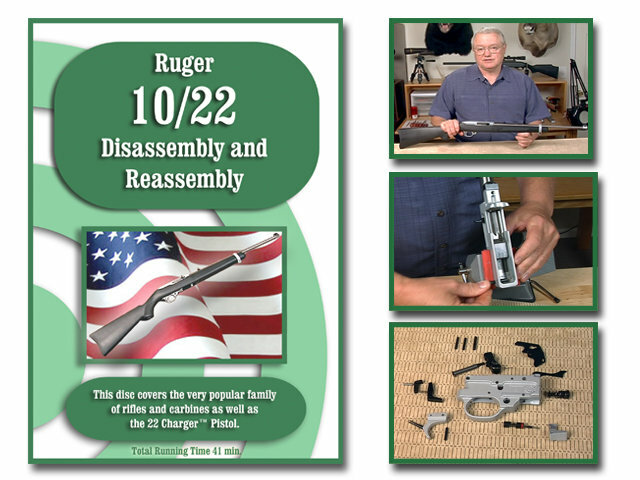 The same procedures used on the 10/22 also apply to Ruger 22 Charger Pistol since they utilize the same internal parts. The 10/22 is fairly simple to disassemble and reassemble if you are familiar with the firearm and the process. Some parts configurations, though, are more complicated than others. Knowing this is mandatory to properly care for your firearm. With this DVD, most gun owners can perform the complete disassembly, cleaning, lubrication and reassembly with confidence simply by following the easy to understand instructions. This DVD also includes the scope mounting procedures for the 10/22. On-Target’s DVDs are digitally produced and provide clear and concise instructions. We at On-Target take great pride in the up-close videography of each DVD.